When Dr. Sawa burst onto the magic scene back in the 1970s, he caused an international sensation. His work with paper, seashells, ropes and especially coins, was simultaneously whimsical and astonishing. 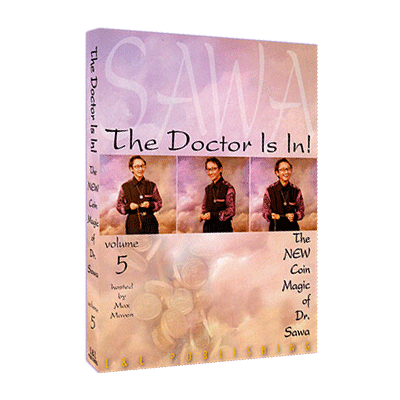 Some years ago, for private reasons, Dr. Sawa vanished from the magic world. Happily, he has resurfaced-his enthusiasm for magic not only renewed, but actually increased. L&L Publishing is proud to present new and astonishing coin routines. 1. Five Cents Panic: A series of unbelievable changes, starting with four half dollars. One becomes two quarters. Another converts to five dimes. The remaining pair changes into no less than 20 nickels! 2. One Dollar is One Dollar: A single silver dollar splits into two half dollars, converts back again, then splits again, then reconverts to its original form. 3. Pendant Cantabile: A circular frame on a silver necklace lends itself to a variety of magical moments, as coins change size, color and form. 4. Brown Trout: It's eagles versus fish in this fanciful account of interspecies rivalry. 5. Surgical Effect: Ready for something weird? Many magicians have pushed a coin through the hand, but never as slowly and graphically as this! 6. Engaged Coins: A lovely copper/silver routine with a romantic storyline that's sure to engage your audience. 7. A Beggar: A Sawa classic reworked. This quirky tale involves a charitable exchange gone awry, with results both magical and humorous. 8. Pantomime Silvers: No patter is necessary as the magic becomes progressively more amazing. It starts with a single coin, but where it goes will leave you speechless!